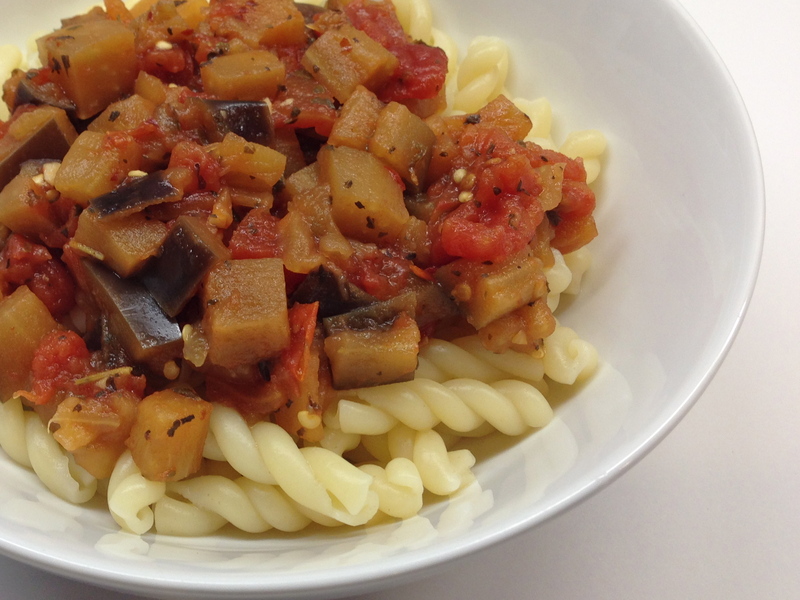 During my weekly trip to Trader Joe’s, I came across some really nice eggplants and decided to make my spicy pasta sauce. What is great about this sauce is that it can be made quickly during the busy work week. In a large nonstick frying pan, heat olive oil with garlic and red pepper flakes over low-medium heat. Be careful not to burn the garlic. Once the garlic starts to sizzle, add the eggplant. Sauté until the eggplant starts to soften, about 5 minutes. Add tomatoes, oregano, basil and bay leaf. Cover and simmer for about 20 minutes. Add salt to taste. Serve over cooked pasta of your choice. Serves 4. Blogger’s note: This is a thick sauce and you may need to add a little water to have a little juice. For those who prefer a sauce with more liquid, use a 28 ounce can of tomatoes and adjust the seasonings. Thank you so much. I like your website…going to recommmend to my daughter in college! Oh thank you so much! Does she have a blog as well? I would love to read hers if she has one! She blogs for her university’s mock trial team and also does Twitter and Facebook for the team. We want to do one together, but she so busy with school!